For other usage of ladder, see Ladder (disambiguation). Ladders are present in certain stages in Super Smash Bros. Brawl, Super Smash Bros. for Wii U, and Super Smash Bros. Ultimate. Characters are able to use ladders to quickly move vertically without jumping. When next to a ladder's base, pressing up on the control stick/d-pad will cause the character to grab onto the ladder; the same happens if standing at the top of the ladder and pressing down. While on a ladder, characters are considered to be in the air, so they are immune to sleep and other such effects. Characters can climb up or slide down ladders by moving the control stick up or down; all characters have the same speed on ladders. Multiple characters can occupy the same space on a ladder. To release the ladder, a character can either reach its end (and dismount) or tap sideways. Characters can grab ladders when passing by one in the air, even while helpless. This is done by pressing up or down; the character will grab the ladder and start climbing/descending. Ladders cause characters to regain all their jumps (with the notable exception of Pac-Man, the reason for this is unknown). 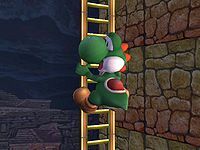 While on a ladder, in Brawl and for Wii U, characters cannot do anything other than climb, descend, or let go, which leaves them vulnerable to attacks if they remain on the ladder. Starting in Ultimate, however, they can also use aerial attacks while remaining stationary on the ladder, a property known officially as a ladder attack, giving them a means of fending off attackers. Even though Bowser can climb ladders in Brawl, he cannot do so in his playable appearance in Super Paper Mario, which was released before Brawl. Diddy Kong's climbing animations are a reference to the animation of climbing up and down vines in Donkey Kong Jr., except Diddy Kong is turned around. Mewtwo, Rosalina, and Bayonetta don't actually climb the ladders, let alone touch them. Instead they use their powers to rise up or float down. Oddly, R.O.B doesn't move his arms at all when climbing up the ladders. This page was last edited on January 10, 2019, at 12:10.